this tree has it's leaves changing! I just got back from a fabulous last minute short ride this afternoon, and boy, is it turning into fall quickly, which makes sense, since it is almost October. 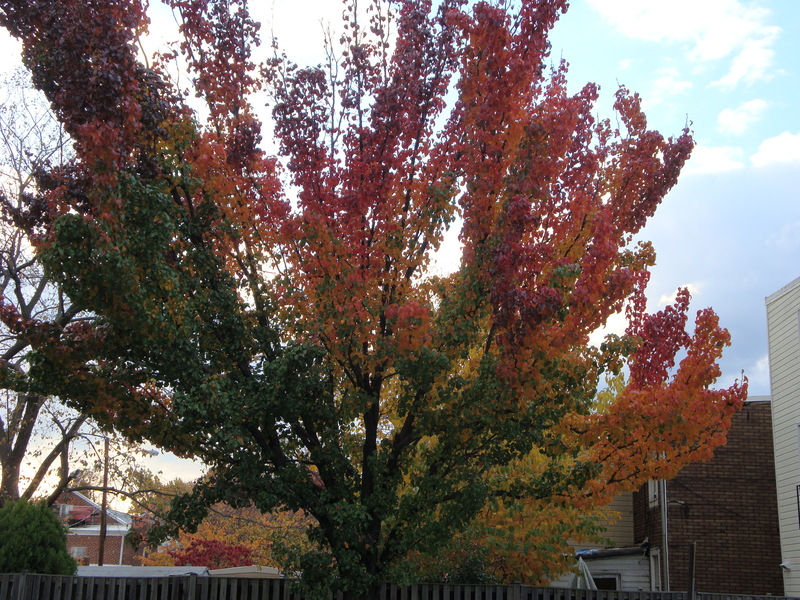 There are so my trees which are changing colors, the scent of people containing with their barbeques. The fresh, crisp, cool are, albeit it turned a bit muggy quickly but who cares, right? The weather has been in the– 70’s–perfect clycling or running conditions. I cannot believe that it is already October and we’re getting ready for the fall festivities of Halloween and Thanksgiving. Growing up in Europe, those holidays were not celebrated, so I never had the full American holiday experiences. My family, however, always cooked a little thanksgiving for our Luxembourgish neighbors, or for the single american teachers who were working in Luxembourg.It meant a lot for them, because they were not with their family. I’ve come to appreciate my family more as I have gotten older, and definitely appreciate the times we all get together.This past year might have been the toughest I’ve experienced, and I do not know what I would have done had I no family around. They come first im my life . There is something special about fall, excluding the fact it leads to winter. Something about the crisp fresh dew on the grass in the mornings, and the freshness of the air as you take your first breath outside after arising from slumber. The haze has settle along the grass pastures, looking thick enough to walk on, but in reality, it only makes your feet we. The leaves of the trees turn a golden, maroon color; becoming live masterpieces before your very eyes; the smell of warm pumpkin bread or fresh-out of the oven apple pie– the scent of cinnamon and allspice in the kitchen. Mmmm.. Fall is a busy season for farmers here as well, esp when they have fields of hay. There is a certain time frame, simlilar to luxembourg, that the farmers make huge hay rolls in preparation for winter–and before it rains–for the winter months, to keep a large stock of food for the cattle. I am in awe of the beauty of the Hudson Valley. Living in Alexandria, you did not really see a change in seasons as well….probably because I lived downtown and there weren’t many trees to begin with. But up here, it’s evident we are moving away from summer. Welcome, fall. Fall in the Hudson Valley offers numerous fall activities for the family, and people living solo like myself. I admit I took advantage of only a few last year, and plan on taking advantage of what there is to offer this year like a dork. There are hayrides, farms where you pick your own pumpkins (definitely reminds me of my childhood in NJ), pick your own apples…the list goes on. In Ulster Park, there is the Headless Horesman, which has haunted hayrides and haunted houses around Halloween time. I would not suggest it for little children, as points can be a little scary (I have no back bone whatsoever–I was scared when I went). But, it’s an interesting show. Fall, that not-yet winter and not-yet end-of-summer time frame is perfect for being outside when you can. Like Christmas, you can see some houses decorated with the seasonal goods. 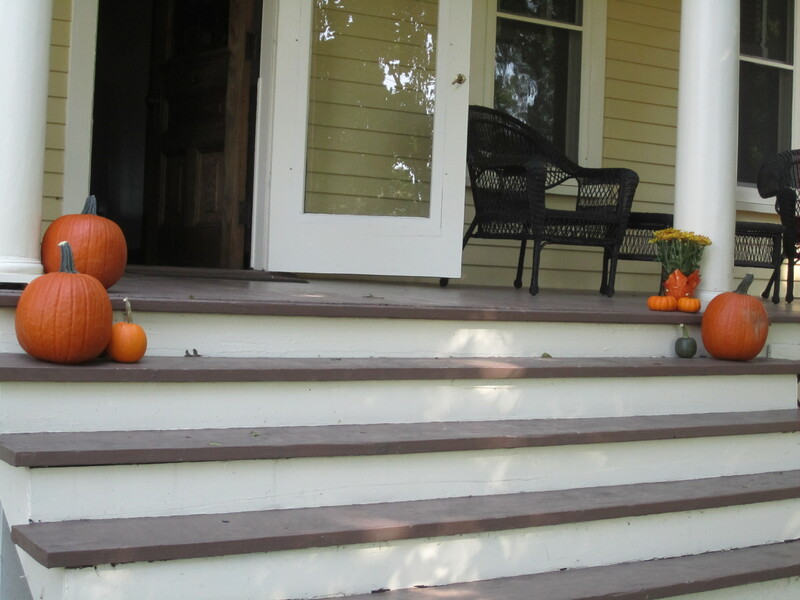 I know, I am one of those people who insist on artfully decorating for every season. No worries though, I am not crazed in my decorating and do not go “overboard” like some houses you might have seen before. I’m a Mini Martha when it comes to internal decoration, and actually, am not too bad at it– another talent of mine: interior decorating. I should have my own show one day. Mini Martha Stewart. What do you think? Below are are a couple places I have passed where you can pick your own pumpkins (and I squeezed in a maze of corn for ya.) Make sure you get out–there is plethora of different places you can bring a friend, child, go by yourself, or bring along the whole family! 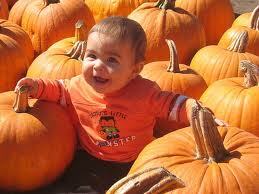 Neer too young to pick apples! Many of the above farms also serve hot, fresh, apple cider and baked goods (yumm!). The Hudson Valley Magazine also offers ideas of what you can do in the area during the fall. I strongly suggest checking it out! 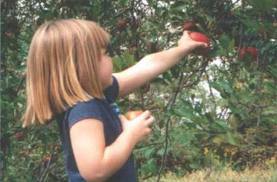 Hudson Valley Parent Magazine has a section on family friendly orchard fun.